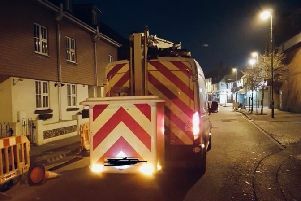 West Sussex Fire and Rescue Service was called to a large fire at Westhampnett amenity tip in Stane Street, Chichester, at 8.25pm yesterday (Tuesday, April 2). Four engines and an aerial ladder platform were sent to the scene, the spokesman said. Crews worked throughout the night to tackle the fire. This morning, two crews remain at the scene. The spokesman said the incident had been scaled down but said: "It's still smoking a lot, it's still going." A fire service spokesman said on Twitter this morning: "Crews are still on the scene of the fire at Stane Street, Chichester. "It is under control but is likely to burn for a number of days. This morning, a spokesman from Petworth Fire Station advised that residents kept their doors and windows closed. A spokesman wrote on social media: "The incident is still ongoing with a large volume of rubbish burning. "We recommend that local residents keep doors and windows closed. "The facility will remain closed today as the fire fighting efforts continue."